Logistics expert Jane Malcolm got her training under fire literally in the Gulf War, where movement of supplies and equipment meant the difference between life and death. Eight years later, she's running her own logistics consulting firm. But as she stands on the brink of her greatest victory, she will be swept into a new, high-stakes game with an opponent she may not even recognize--until it's too late. Poised to close a multinational deal, Jane learns that a plane crash has claimed the life of her father, Royal Akers, head of a faltering superstore chain. Determined to restore her father's legacy, she races against time to find ways around the Akers dynasty's woes and undercover their source. For it rapidly becomes clear that these are not random mishaps, but corporate sabotage. International trading partners suffer the fallout, ratcheting the stakes even higher. Economic disaster threatens to topple a fragile government. If Jane makes one false move, it could be her last. 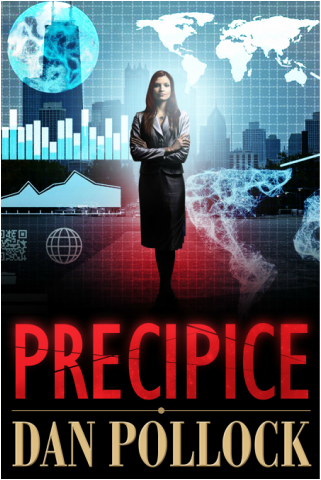 Tense, taut, Precipice is an edge-of-the-seat thriller, creating an all-too-plausible nightmare scenario. Read Martha Groves' inside story about the writing of Precipice , “One for the Books” (Los Angeles Times, Sept. 26, 1997, print edition D-1).